The UK broadband market may be about to see the same sort of disruption that TalkTalk created in 2006 as TalkTalk has launched its up to 940 Mbps service in York with the same price as their Simply Broadband ADSL2+ packages, i.e. £21.70 per month. The screenshot of the map from the TalkTalk Ultrafibreoptic website shows the small part of York where the service is in theory already available and the parts where it will be available next. Interesting TalkTalk has avoided headline figures of 1000 Mbps and words like Gigabit on its website, for the simple reason that Gigabit Ethernet which is how people will connect their computer from the TalkTalk supplied router (wireless will be available but will not go that fast) has a speed limit around the 940 Mbps mark due to the overheads in carrying TCP/IP data in Ethernet frames. With the price sensitive UK market it is not just about the fastest speeds and by pricing at £21.70 per month all inclusive, TalkTalk is actually making it a no-brainer for existing TalkTalk customers to upgrade, as they will save between £10 and £20 per month on the standard Openreach FTTC based pricing. Adding the Essentials TV service raises the price to £21.70 per month and Plus TV to £36.70. There is no voice line rental charge to speak of as it is all rolled into a single payment. The area where the UFO has landed appears to match up with with a large Tesco's and retail park for now which may mean Wi-Fi speeds may improve if businesses sign-up to a business service. Right - time to Move to York then! Swadlincote is getting the 1GBS sky fibre trial, they are installing it all outside my house as we speak. The website claims a speed >900Mb (ps?) I wonder what speeds individual connections (accounts) will get bearing in mind the problems of contention. The price is very attractive as it appears there is no additional line rental charge. CityFibres York fibe is set at 10Gbps, QoS will see business connections have the most advantageous stable speeds with residential making use of what is left. Burst speeds of 940 Mbps is feasable but stable speeds will be a lot lower, especially as more customers load the system. Good choice of name given how rare sightings of Cityfibre based retail services are. @themanstan Are you saying the total capacity over the dark fibre is 10 Gbps? I would actually expect there to be multiple lots of 10 Gbps available. @herdwick CityFibre in the retail sector will remain rare, they are concentrating on being the fibre in the ground people with Sky and TalkTalk being the face that people know about for retail sales. I like this map. It seems to show that they've cabled up lots of areas of parks and woodland. I guess that's one low cost way of increasing your geographic coverage! I would expect multiple fibres, but how many customers would you expect TalkTalk to pile into each at these prices? They are what appears the WalMart of ISPs. 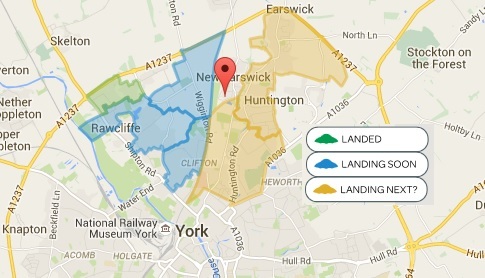 CityFibre have only ever mentioned high capacity network for York and have never defined the capacity. Not hard to add capacity and the new 100G final specs came out in March this year so the equipment should not be too far off which would allow existing to be upgraded. @lockyatlrg Ah so they are, there are current street works in progress in Woodville and Midway. @themanstan How heavy do you expect usage to be? Customers don't suddenly start using 30TB/month because they can. VM have the heaviest average users and their average isn't 100. Is this PtP or PON? If SKY / TT port all their customers over to CFH from BT things could get interesting for sure! @themanstan, are you sure about that 10G? I assume you are aware of where the OLTs are housed and who's backhaul is on hand? @WWWombat CityFibre could deliver both P2P and PON. Currently every drop is P2P with a Central split. As an Open Access Network, CFH have pulled together a v.good passive network with a possible route to P2P.